Villagers across this district and Fatehgarh Sahib are gearing up to give a people’s farewell to Gurcharan Singh Tohra — their pradhanji for decades. They are raising welcome arches, a huge ‘pandal’, and organising langar for the bhog ceremony of Pradhanji. Many are just standing guard outside Pradhanji’s house. Members of the Punjab Congress Legislature Party in general and members of the Council of Ministers in particular are sharply divided over attending the bhog ceremony of Shiromani Gurdwara Parbandhak Committee chief Gurcharan Singh Tohra who died in a New Delhi hospital on April 1. Today it was the turn of Punjab Deputy Chief Minister Rajinder Kaur Bhattal to pay homage to the late Shiromani Gurdwara Parbandhak Committee (SGPC) president Gurcharan Singh Tohra. Gurcharan Singh Tohra had not claimed any car/petrol or telephone bills from the SGPC during his present stint as its president from July 27, 2003, till his death as part of austerity measures. The controversy over the airlifting of Gurcharan Singh Tohra to Escorts Hospital has been compounded with Deputy Commissioner Raminder Singh revealing that the ex-chief of the SGPC could not be taken into the air taxi on a stretcher despite two attempts made by doctors due to the narrow door of the aircraft. The Sikh Jagriti Manch today demanded a probe into the circumstances that led to the death of SGPC president Gurcharan Singh Tohra. Ashes of late Shiromani Gurdwara Parbandhak Committee President Gurcharan Singh Tohra were today collected and immersed in the Bhakra Canal, one km from his Tohra village in this district, by relatives and associates. It is the second time that the Shiromani Akali Dal has suffered a major setback at the time of elections. This time because of the death of the SGPC chief Gurcharan Singh Tohra . Late Gurcharan Singh Tohra’s son- in- law Harmel Singh Tohra today blamed the doctors of the Escorts hospital in Amritsar for the death of his father-in-law by claiming that the condition of the late leader took a turn for the worse after doctors gave him medicines to make him pass stool on March 30. Punjabis collected in the thousands, bearing the heat and dust to pay their last tributes to the common man’s “Pardhan”, Gurcharan Singh Tohra, at the cremation ground in this village, which was transformed into a sea of blue today. If sworn enemies SAD chief Parkash Singh Badal and state Chief Minister Capt Amarinder Singh were standing together yesterday to receive the mortal remains of Gurcharan Singh Tohra at Shambu, then both Badal and Amarinder were sitting cheek by jowl at his funeral in Tohra village in this district today. The Giani Dit Singh Memorial International Society today mourned the death of Jathedar Gurcharan Singh Tohra, president, Shiromani Gurdwara Parbandhak Committee. The Deputy Prime Minister, Mr L. K. Advani, today expressed grief over the demise of the SGPC President, Mr Gurcharan Singh Tohra. Cavalcades are not new to this village, which has been made famous by its most eminent son, Gurcharan Singh Tohra. However, today’s stream of vehicles was one the villagers were expecting with a heavy heart since morning, when they came to know their beloved leader had passed away in Delhi last night. The Punjab Government has declared a holiday tomorrow in all its offices, boards, corporations and educational institutions as a mark of respect to Jathedar Gurcharan Singh Tohra, SGPC chief, and member of the Rajya Sabha, who passed away early this morning. Punjab Chief Minister Amarinder Singh today expressed surprise at the decision of the Shiromani Akali Dal President Parkash Singh Badal to shift critically ill Gurcharan Singh Tohra to Delhi yesterday from Amritsar. Mr Gurcharan Singh Tohra, who missed entering the Rajya Sabha for a record sixth term, had a distinct political career in which he never sought election to the State Assembly. From 1969 till his death, he remained Member of Rajya Sabha for almost 21 years spanning over five terms. Mr Gurcharan Singh Tohra was the most celebrated leader of the Khalsa Panth for about four decades. He not only lent a thundering voice to Panthic politics but also gave a new meaning, direction and idiom to it. Mr Gurcharan Singh Tohra had started off as SGPC chief way back in 1973 by initiating kar seva at the Golden Temple sarovar. That is how he closed his innings 31 years later. The massive heart attack he suffered after doing kar seva at the same sacred pool on March 25 proved fatal. Silently and without ado, Sardar Gurcharan Singh Tohra, the uncrowned King of rural Punjab and the Sikhs, has passed away into the night. There will be today, possibly no trumpets, loud cheers or gaudy spectacle to accompany him as he makes his last journey in his native place. The Punjab Chief Minister, Capt Amarinder Singh, has expressed grief and sorrow over the demise of the SGPC president, Mr Gurcharan Singh Tohra, who passed away in New Delhi last night. At ten, a young “man” of this village with a small land holding took Labh Singh under his patronage. The young man, bereft of a father, worked shoulder to shoulder with Labh Singh on his 22 bighas of land, often taking on hard labour and letting his “servant” do the lighter work. The death of Mr Gurcharan Singh Tohra, president, SGPC, was condoled by different political parties besides the Governor of Punjab here today. Justice O.P. Verma, Governor, Punjab, in a press note expressed “deep shock over the demise of Mr Tohra. A pall of gloom descended on the city as the Sikh community in general and a number of educational institutions in particular, mourned the death of Mr Gurcharan Singh Tohra, President of Shiromani Gurdwara Parbandhak Committee. Prayer meetings were held to pay homage to the departed leader, who had remained in the centre-stage of Sikh politics in Punjab for several decades. Veteran Akali leader and SGPC chief Gurcharan Singh Tohra died at Escorts Hospital, New Delhi, tonight. 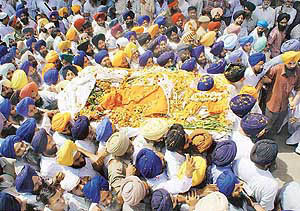 Mr Ranbir Singh, personal assistant to the SGPC chief, said doctors at the hospital declared Mr Tohra dead at 12.41 a.m. The team of cardiologists attending on SGPC President Gurcharan Singh Tohra felt that his condition continues to be critical and they were keeping a close watch on his blood pressure and pulse. The condition of SGPC President Gurcharan Singh Tohra worsened last night when the doctors attending on him tried to remove his life support system partially at the Escorts Heart and Super-Specialty Institute here. Even as the condition of Mr Gurcharan Singh Tohra, President, Shiromani Gurdwara Parbandhak Committee, was showing signs of improvement, a team of doctors at the Escorts Heart and Superspeciality Institute here feels that he continues to be critical. Mr Gurcharan Singh Tohra, president, Shiromani Akali Dal, today suffered a massive heart attack after the historic kar seva of the sarovar of the Golden Temple began here today. As Akali stalwart, Gurcharan Singh Tohra was re-elected SGPC chief for the 27th term which is unprecedented in the 78-year-old history of the SGPC — considered ‘Mini Parliament’ of Sikhs. He could not ensure the election of his confidant Sukhdev Singh Bhaur as senior vice-president. MANY in Punjab have watched Mr Gurcharan Singh Tohra’s re-election as the President of the SGPC with a distinct sense of déjà vu. This is quite unlike the other elections during his earlier, record-breaking 25 years at the helm of the premier Sikh religious body. This ensured his stamp not only on the affairs of the Sikhs worldwide, but also those of the Punjabis at large. What happens now remains to be seen. Even as Mr Gurcharan Singh Tohra was elected as 26th President of the Shiromani Gurdwara Prabandhak Committee at an emergency meeting of the Executive Committee here today, Bibi Jagir Kaur and Mr Kirpal Singh Badungar — both former President, and a number of pro-Badal SGPC members were absent. The foe-turned friends, Mr Parkash Singh Badal and Mr Gurcharan Singh Tohra, today called upon the Sikh sangat to give a befitting reply to the alleged repression let loose by Capt Amarinder Singh government against the Akalis. The two Akali stalwarts, Mr Parkash Singh Badal and Mr Gurcharan Singh Tohra, today formally announced unity between their two factions, saying the new Shiromani Akali Dal would continue its alliance with the Bharatiya Janata Party. Former Chief Minister Parkash Singh Badal and former Shiromani Committee President Gurcharan Singh Tohra today signed a formal declaration effecting Akali unity and appealing to party workers and leaders of both the Shiromani Akali Dal and the Sarb Hind Shiromani Akali Dal to forget differences and work unitedly for the welfare of the “panth” and Punjab. To understand the implications of the Badal-Tohra rapprochement, it is important to recall the currents of Akali politics since the assassination of Sant Harchand Singh Longowal. During the whole turmoil that ensued only three prominent Akali leaders — Mr Parkash Singh Badal, Mr Gurcharan Singh Tohra and Mr Surjit Singh Barnala — have shown themselves to be the real power contenders. The first concrete step towards a formal split in the Shiromani Akali Dal may be taken at a meeting of Tohra loyalists convened here tomorrow.